Don’t mess with Liam Neeson’s family. Or just don’t mess with Liam Neeson in general. While vacationing with a friend in Paris, an American girl (Maggie Grace) is kidnapped by a gang of human traffickers intent on selling her into forced prostitution. Working against the clock, her ex-spy father (Liam Neeson) must pull out all the stops to save her. This film proves two things: 1) Liam Neeson can act in anything by just playing them, and 2) director Pierre Morel can make some great exciting action-filled movies but cannot write an effective original screenplay at all. The film suffers from its totally lackluster script. The relationship between Neeson and his daughter didn’t feel real or true at all and if anything it just felt like two actors playing father and daughter. Oh wait for a second that’s what it was, so basically they did just a horrible job at that. Much of the screenplay is very cliched, and most of the lines in this film feel a little too familiar to other action filled movies. The movie sort of felt like a big-budget 80’s action film where one man fights off against a thousand people. This was cool to see in such a 21st century way but in all it was a laugh fest since the film was very corny and highly unrealistic. Also many of the villains seemed so dumb and not very much of a threat. The high point of this film has got to be the action. Its exciting, over-the-top, and ultimately very violent. Just seeing Liam Neeson lay the whoop down on some Frenches is a sight to see. The film’s action is completely outrageous but that’s the best thing about the film it keeps you on the edge of your seat. 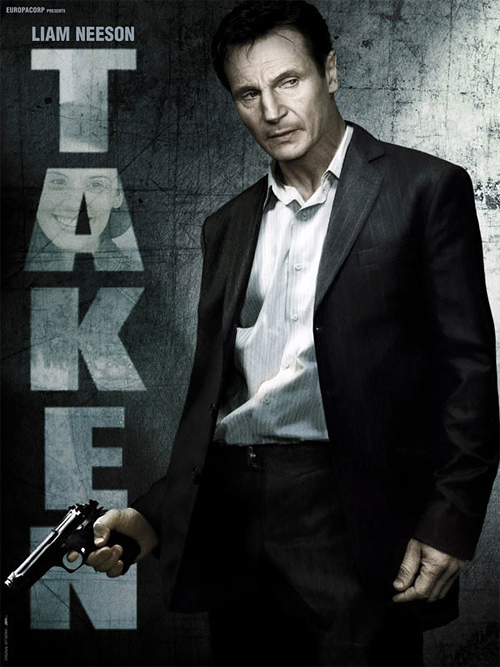 Liam Neeson also shines very well in this film showing a great sense of raw edgieness that we have seen many times before but this more in a way that makes him dominant. He totally feels like a James Bond that knows kung-fu. Maggie Grace is great as the clueless, naive, rich, spoiled daughter that is kidnapped, while Famke Janssen as the equally naive, and estranged ex-wife of Neeson, pulls her role off well. The film is very brainless but has a raw performance from Liam Neeson and features some high quality action that keeps you entertained throughout.